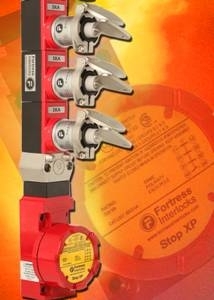 Industrial safety specialist Fortress Interlocks has introduced an ATEX Certified, explosion protected safety switch key station. The CPS4STOPXP key station is designed to release keys which can be used to control mechanical door locks that provide access to machinery and process lines operating in potentially explosive environments. Both the switch and the door locks are suitable for use in zone 1 and 2 environments such as those found in the chemical and petrochemical, paint, pharmaceutical, flour, powders and mining industries; the electrical parts are ingress protected to IP67. The heavy duty CPS4STOPXP safety switch key station is explosion protected, available with up to a maximum of five safety key adaptors. By turning the first key the machine is isolated and the other four keys are released. These keys can be used to open a maximum of 5 ATEX Certified 'DM' mechanical door locks that give access to the safeguarded area. Restarting the machine is only possible when all keys are back in the CPS4STOPXP key control station. This interlocking system complies with the ATEX Directive, meeting the European Hazardous Location Designation: EExd IIC T6 category II2 GD, SIRA 00ATEX 1037X. Sealed to IP67 and IEC 60529 it is protected against corrosion, water, dust and oil. The CPS4STOPXP features dual channel safety circuits with positive break switches. It is manufactured from stainless steel and zinc alloys for smooth and reliable operation. The CPS4STOPXP is part of the Fortress range of amGard products that combines both trapped key interlocking and switch technology to control access to dangerous machinery thereby safeguarding personnel from injuries and significantly reducing damage and down time.